Flexible plastic bollards provide strong visual indicators for drivers. They offer a strong, robust aesthetic to direct traffic flow and identify off-limit areas. Bollards stand at an ideal height to ensure drivers can see them. Flexible posts provide traffic control on their own but can also be used with other traffic-calming infrastructure such as medians, extended sidewalks and crosswalks. Flexible bollards are available in standard black to complement any contemporary or traditional architectural and landscape design. Other colors are available—contact our Sales Department for more information on ordering. Many flexible bollards come equipped with reflective strips for maximum visibility. Flexible bollards are made from durable polyurethane to ensure lasting performance. Bollard coloring permeates throughout its internal structure. Any scratches, scrapes or dents from extended use or impacts show minimal markings. 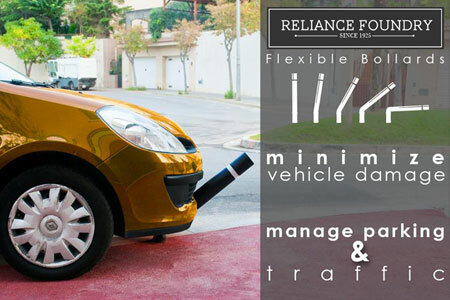 All Reliance Foundry flexible bollards have undergone rigorous impact testing to ensure lasting performance after repeated vehicle collisions. Flexible bollards have been proven to withstand full 90-degree flexion up to 50 impacts and partial 45-degree flexion up to 500 impacts. They can be installed as fixed bollards—either embedded in new concrete or surface-mounted to existing surfaces—or with removable mounting kits. Reliance Foundry Co. Ltd. delivers the highest-quality stock and custom-designed products for architectural site furnishings, traffic management and industrial applications. Since 1925, Reliance Foundry has built upon a long tradition of metal casting expertise to become an award-winning supplier for high-profile and everyday operations across North America. Reliance Foundry was first incorporated by four foundry workers in 1925. It grew to become Vancouver's largest working foundry—fulfilling contracts for municipal authorities and companies in the mining and forestry industries. During World War II, employees worked 48 hours per week, casting 10 tons of metal per day to supply parts for the Allied forces war effort. In 1966, a fire at the original Vancouver site forced the company to relocate to a new location in Surrey. By the 1990s, Reliance Foundry began outsourcing production to increase the range of offered products and expand beyond regional services to become a continental supplier. The company moved to its newest location in 2005—and in 2012 was awarded the Surrey Board of Trade's Business Excellence Award.